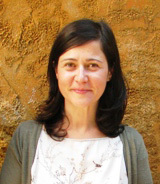 Anna Gutiérrez Garcia-M. received an MA in Lithic and Ceramic Analysis for Archaeologists (University of Southampton), and a PhD in Archaeology (Autonomous University of Barcelona-UAB). She developed her research at the Laboratory for the Study of Stones in Antiquity (LEMLA) at UAB, before being head of the Archaeometric Studies Unit at the Catalan Institute of Classical Archaeology (Tarragona, Spain) and being Chaire Junior LaScArBx at IRAMAT-CRP2A (UMR 5060 CNRS-Université de Bordeaux Montaigne, France). She has written and co-edited several works on the exploitation, distribution and use of stones in Antiquity, such as the monograph (2009) Roman quarries in the Northeast of Hispania (modern Catalonia); (2012) Interdisciplinary Studies on Ancient Stone. Proceedings of the 9th ASMOSIA Conference (Tarragona 2009); and (2018) Lapidum natura restat… Carrières antiques de la péninsule ibérique dans son contexte (chronologie, téchniques et organisation). Books by Anna Gutiérrez Garcia-M.